In February we incorporated two new frugal strategies into our wheelhouse of natural frugality in Seattle. Even though we’re earning more than we ever have before (hello 25% tax bracket! ), we haven’t outgrown the frugality we practiced during grad school. Having a baby threw things off for a little while, but we’re getting back on track. On our first visit to Cash & Carry we didn’t buy much but were mostly checking out prices. We are starting a price book to be certain, but it seems that the prices are lower than Costco’s on many items that we typically shop for. The range of items they sell is certainly smaller, but we might not care about that as much. At this point it’s possible that Cash & Carry might even be able to replace our Costco membership if it dramatically reduces the amount of money we spend at the latter (the membership fee has to be worthwhile!). Plus, Cash & Carry is right down the street from our preferred grocery store. I’ve made two trips to Cash & Carry now and purchased ground beef (10 lbs), bacon (5 lbs), pork loin (10 lbs), spinach (2.5 lbs), asparagus (2.25 lbs), and olive oil (3 L). It remains to be seen whether Cash & Carry can help us stay within our grocery budget, which has been quite a challenge recently. This second frugal strategy has been staring us in the face for months. We don’t have an in-unit washer and dryer in our apartment but rather share one pair in the basement of our building. When we started cloth diapering DPR, we purchased a portable washing machine to wash a load of diapers every other day. It’s about 2/3 of the size of a regular washer, lacks and agitator, and takes longer, so we didn’t initially plan on using it for our regular laundry. We were using the basement washer and dryer for our clothes, but it’s become more and more annoying to make trips down there as DPR has grown. Our laundry started getting backed up. But we put up with it for a long time, doing laundry mostly on weekends and weekday evenings, because it was relatively cheap. The coin-operation component of the downstairs washer broke several months ago, making it possible to wash a load of clothes without paying anything. So each load was only $1 (for the dryer). But in February, after many months of no action, our landlords finally fixed the machine and upped the price to $1.50 per load for the washer (from $1). Paying $2.50 per load of laundry was a tough pill to swallow after months of $1 per load. Suddenly that $10 roll of quarters would only wash four loads instead of ten! That was the straw that broke the camel’s back in terms of switching to using our portable washer. We’ve started doing our clothes in the portable washer on non-diaper washing days. Most loads we hang dry the clothes on our shower curtain rod and drying rack with our fan on them, but for heavier items we use the downstairs dryer. This should save us quite a bit of money (in quarters) as our slight increase in electricity usage should be far less expensive than $2.50 per load. It’s also a lot easier than making trips to the basement, which means we actually do laundry more often. I’m looking forward to seeing if these new strategies impact our bottom line! 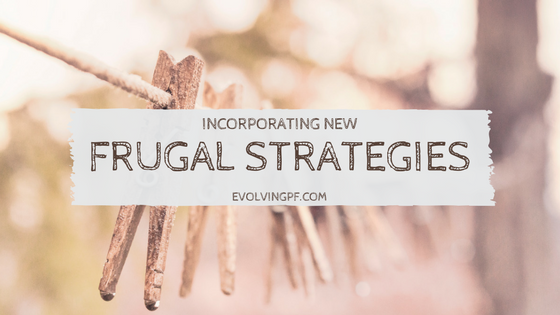 What new frugal strategies have you started using recently? Do you frequent a restaurant supply store or other type of low-cost grocer? Have you ever had to use coin-op laundry and did you use any strategies to avoid it? 9 Responses to "Incorporating New Frugal Strategies"
I got in the habit of hang drying clothes when my previous apartment had a coin operated laundry system. Despite having a dryer in my apartment now, I still hang dry clothes. Reduces energy use and makes my clothes last longer – all that lint came from my clothes! Great points! We don’t like how our clothes are a bit stiffer, though, even with the fan on them. We still tumble dry our towels/linens. I find adding a little bit of vinegar to the wash cycle eliminates the stiffness. Personally I like my towels when they’re stiff. Great tip! I’ll have to try the vinegar out. Good finds, especially on the potential Costco replacement now that they’re raising membership rates. Oh no are the rates going up again? We just paid for the upcoming year last month. It’s so funny to me, an Aussie, that what you call a portable washing machine is a standard washing machine in households all over our fair country!! I didn’t know that – interesting! I don’t know anyone else here who has one. Do you all use ‘portable’ dryers as well or line dry?